So I turned 62 today. No way to spin that young. I can collect social security. I have this elaborate fantasy about (some mythical) birthday party. All my family & friends would be there. I’d come in on a liter supported by 6 (it used to be 4 but I’m really old and fat now) bare chested young men. There would be glitter cannons. Um – what really happened. Tom has a miserable chest cold. We watched bad tv because its raining. Rain is a blessing because 1) drought in Georgia and 2) if it was nice, we’d have to finish painting the trim on the outside second story windows. How marriage enhancing it will be to take turns standing on a ladder with a bucket of paint? Probably not very. Tomorrow I head to Maryland. I’m Monster sitting while my Daughter and Son in Law head to Paris for my girls 30th birthday. I’m so pleased that they are taking this trip. What could be more perfect than birthday dinner at the top of the Eiffel Tower? Meanwhile, Monster led the Epic Nap Parade today. 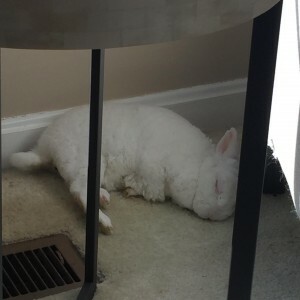 His favorite napping place is behind the occasional table, near the heat vent. He snores.